How can I activate a PMS integration? HOME > CHANNEL MANAGER AREA > How can I activate a PMS Integration? STEP 1: First you need to contact Guestcentric and confirm us the activation of your PMS service. STEP 2: Our technical team will be in contact with the PMS technical team to start the integration process. STEP 3: After the confirmation from our technical team, the integration is active and working properly, as displayed on SETUP - CHANNEL SETTINGS. STEP 4: With the integration active, the new reservations received will now present a PMS code on the Notes area of each reservation (this depends on the PMS used). In case you detect that a reservation was not registered at the PMS, please contact us so that we can resend that reservation to the PMS provider. 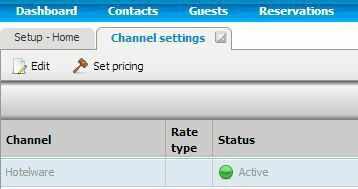 Some PMS's might allow you also to send rates/inventory updates to Guestcentric as a channel (2-way connection). For more information on this, please contact your PMS account manager to confirm whether this feature is active on your contract. After receiving the credentials from the PMS technical team, we estimate that the activation process on Guestcentric side will take up to 48H to complete. Please check here the details on What do I need to set a PMS Integration?